Is that local animal shelter dog in fact someone’s lost pet? Did you know that 30% of pets will go missing in their lifetime? That’ 1 in 3. According to studies performed by the ASPCA and the Humane Society of the United States the estimates show that 40-60% of dogs in local animal shelters are actually someone’s pet that went missing. 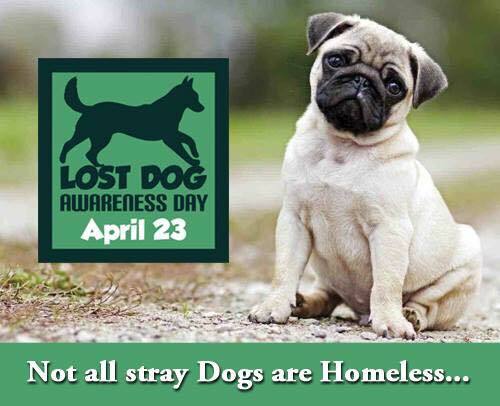 Established in 2013 by Lost Dogs of America, Lost Dog Awareness Day seeks to bring your attention to these startling statistics and to remind you to micro-chip your pet. Not later, NOW! Since forming in 2011, Lost Dogs of America has helped 42,000 dogs find their way back to their loving homes. Imagine how many more need help? So on this day, here are 3 things you need to do to celebrate and raise awareness to this all too common problem. Microchip your pet – We know you ‘meant’ to when you adopted your dog but you never got around to it. Or maybe they have a microchip but you never registered it or re-registered it since it expired 5 years ago. Let today be your reminder that the #1 that dogs get reunited with their owners is with a valid microchip. Head to your local animal shelter and they’ll be glad to help you for a reasonable fee. Take good photos of your pet – What would you do if your dog went missing right now? Do you have recent, good quality photos of what they look like? Facial features, distinguishing marks and multiple angles. If your pet goes missing, you’ll need to list them on HelpingLostPets.org or PetFBI.org and you’ll need good photos to do that so grab your camera and take Fluffy outside in the natural light so we can actually see her beautiful features. Sign-up to volunteer to help reunite lost dogs – Why not give back by becoming an animal rescue volunteer. Bet you didn’t even know that you could sign-up to be a lost pet support person did you? Well now that you know, go do it. You can sign-up with Doobert.com or directly with your favorite Lost Dog state group (Lost Dogs of Wisconsin, Lost Dogs of Illinois, etc.) and you can help others get reunited with their lost pet. So make today the day you microchip and raise awareness to this all-too-common issue of lost dogs ending up in animal shelters.